There are many families who actively choose to have one parent stay at home with the children while the other works outside the home. Can You Find Financial Freedom On One Income? Quite simply the answer is yes you can. However, the sacrifices involved in this choice may be tough for some families. It is a matter of what is ultimately the most important thing to you. Would you rather do without some things now for financial peace later, or struggle with finances both now and later? Many years ago, I struggled with this. I longed to stay home with my kids and watch them grow– it was just something that I wanted to do. My husband was working full-time and made about $40,000 a year… not bad for a family of four, with one car, in a two bedroom apartment. I was also working in a restaurant and had to work long nights, all holidays and missed spending that time with my two boys. So, we made the choice. I chose to be happy (something that was important to me) rather than live on two incomes and be able to afford the luxuries of life. No, we couldn’t buy EVERYTHING we wanted.. but we did just fine living on one income and most importantly, we were happy. This post is not about the single parent, or single individual operating on a singular income. This is about the family with children who chooses to have one parent working full time while the other parent stays at home to raise the children. These suggestions, thoughts and recommendations are made with that in mind. 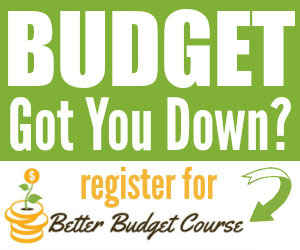 Learn to do without frivolous expenses. There are a lot of things that we get accustomed to having that simply are not necessary. Things like the weekly take out, or going out to a new release movie. New clothes every season, or a fun pair of shoes that you saw on sale. While these are not unreasonable items to spend your money on, they are items that you are not going to suffer without. You will be able to enjoy life and have fun without them. You’ll just have to do so in different ways. Seriously stay within your budget. Often we set a budget but have wiggle room, or skip outside the lines from time to time. This is a time when you really must stay within your budget. One small slip could send you into a financial tail spin. With the goal of savings and finding financial freedom in mind, it is important to focus on the big picture and not just the immediate desires. Change spending habits. This is the time when you really have to look at your spending habits with an honest eye. Look at what you spend money on that could be considered conveniences. Work to communicate with your spouse about better choices and put them into place. Hold each other accountable in the process. We also started couponing— and saved thousands of dollars over the course of 5 years. It took a couple of months to learn how to really save–but after we learned, we were saving all the time. When you choose to live on one income, you are already getting your spouse and children involved in your financial life. Everyone must be on board to make this work. You must also be willing to make some sacrifices to find financial freedom on one income. The end result will be a much more rewarding life with your family. 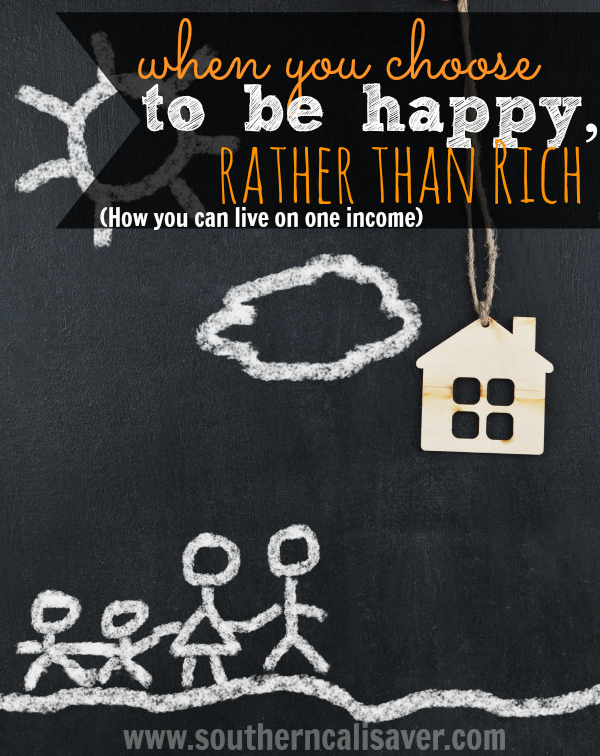 Have you taken the leap to live on one income? I totally agree. I just had my second child in November and decided to leave a six figure job to stay home with him. It is the best decision I ever made! It required a lot of advance financial planning but we are making it work (with the help of Couponing websites like yours). Thanks! you are so lucky to have the support of your mother. I bet it makes things a lot easier on you and your husband. You are so right Blythe! Getting rid of that “poor me” attitude is important! I also decided to stay home when I had my first child 3.5 years ago. I was a teacher and couldn’t imagine giving my all to children that were not mine all day and then being too tired for my own. It’s been a struggle! We definitely do not get to do everything or buy everything we want, but I’m so thankful we found this group! We are happy and we are even more appreciative when we are able to splurge a little. I just want to let you Moms know that you are important. Staying home and raising kids is a tough but rewarding ‘career’. All Moms and Dads are important, but I sometimes feel that SAHM or dad’s are not shown enough appreciation. I loved reading this post! Our family income is around $45,000 and consists of 2 adults, 3 children, & 2 dogs. My husband & I made the decision that I would stay home with our children after our 3rd was born in 2012. We went from 2 full-time incomes down to 1 and it has been the best decision we could’ve made. It definitely hasn’t been easy. 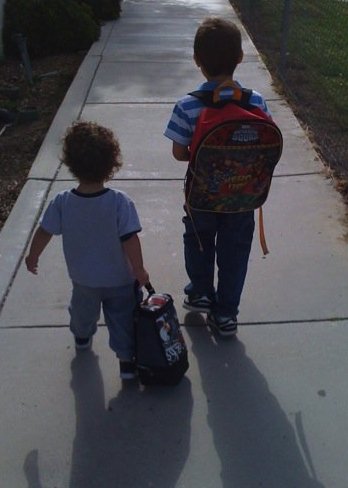 Something’s we’ve done to save on expenses are: moving into an apartment closer to my husband’s job, making a budget, couponing, I opt to walk the kiddos to school on days when the weather permits to save gas, etc. Although we can’t always get what we want. 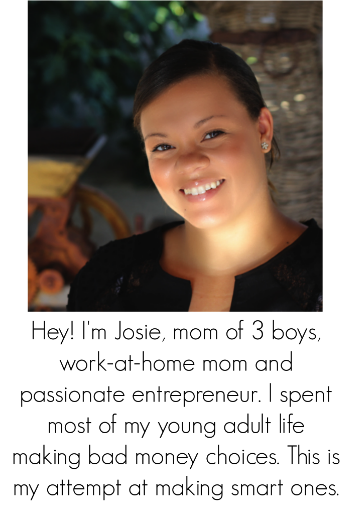 We always have what we need and for us it works 🙂 Thank you for sharing your story Josie. I appreciate all of your hard work and dedication. You’ve helped us save so much! It’s such a coincidence that you posted this on my last day of my full-time job! I voluntarily quit due to being “burnt out” which is common in the mental health field. The scary thing was that I was the sole income-earner with health benefits. My hubs receives a pension from the VA; enough to cover rent and some expenses. I don’t plan to be a SAHM permanently, just until I can pass my licensure exams and help my husband transition into the workforce but that can take up to 1 year. So there are a lot of different factors involved. Your post is honest and validating so thank you. I will follow these frugal series in hopes that we won’t be eating rice and beans for the next 6-12 months. LOL! Yes. We live on one income and its great. Yes you cant have everything but it stops you from wasting money on expensive stuff you really dont need. I also love the time I get to share with my lil guy and early on me and my husband decided we were only having one child so we both decided one ofus need to be the stay at home parent until hes in regular school then maybe ill try and get a small partime somewhere. love this post. we have taught our 2 kids (13 & 10) that just because you want it doesn’t mean that you need it. WOW! I am amazed by you ladies!!! I stay at home with our 4 kids, 1 of whom is special needs. My husband makes much more than $40000/year and we are struggling! We rarely eat out, we don’t spend money on frivolous things, we own 2 cars that we don’t have loans on. We do have some money in savings, but we certainly don’t live the high life! Couponing here is SO much harder than anywhere else I Have lived, but I do try to get some things. I do not understand how people can afford to live in California, especially on that salary-hats off to you all!!!! Its true Andrea! I am living proof 🙂 We lived in a apartment vs a house and we really just watched what we spent money on. We didn’t have the best cable plan or the best internet. We didn’t shop at costco and used a LOT of coupons for diapers and toiletries. .. but we made it work! I think it also depends on where you live in California.. In LA in might be a lot harder to do this.. however, we live in the inland empire and isn’t terribly expensive. I loved reading this post and the comments again even though I read it just 2 months ago. I was always a SAHM to our 5 kids, and can’t imagine not being that since my husband had to work 7 days/week for his family’s business. 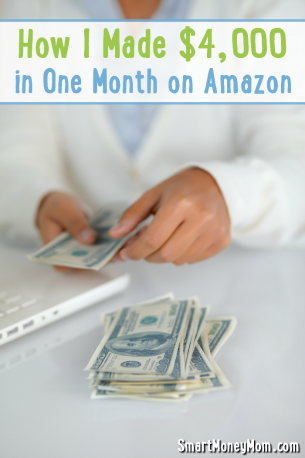 I only started couponing lately, because of business losses and less work for my husband. However, I’d always been quite frugal, so still incorporate that with couponing. I think one thing many people miss when thinking of frugal and/or couponing is comparing some items. Let’s say, for example you have a coupon for rolls, but ounce for ounce, a loaf of bread is still cheaper. Well, of course, sometimes you’d choose the rolls, but for everyday use, choosing bread would the better choice price-wise. And this type of decision, on all kinds of items, will save you lots of money each week. I think it’s these little choices that often get un-thought of, that can really make or break someone’s capacity to switch from working to staying home with the kids. Following this blog has helped me additionally by making me really get to know my prices: I realized I was getting downright taken on a few items at my regular store and now I plan enough, so I can combine frugal, with couponing, with being willing to go to various stores. And to be efficient about going to various stores, I plan some of “my” shopping with my husband’s or son’s schedule, so that they can do the deals when they happen to be going right by the store with the deal anyway.